If you subscribe on this site (on the side bar) you receive a weekly writing prompt and first notification of any new events we post on this site. But you don’t get updates. If you want to know how many places are left on our workshops and courses contact us and we will put you on our email list. Usually, we send out mails each month. Our workshops sometimes sell out very quickly, so if you’re interesting in joining us, we recommend you sign up. All our current Autumn events are sold out, but we’ll be posting more news soon. If you’re already a subscriber, let us know if the visual prompts are stimulating new writing. We’d love to hear about the stories you create and any other feedback. 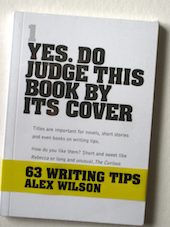 For further writing tips buy Alex’s book of 63 tips and for writing advice check out Jude’s blog. This entry was posted in Writing Events and tagged Events, news, short stories, updates, workshops, writing prompts on September 13, 2016 by Editor.